Welcome to Ramapo Green’s Sustainable Living Eco-stewardship (SLE) Program…! Ramapo College’s SLE Program, relaunched in the Spring of 2017, aims to engage undergraduate students in promoting green lifestyles and in taking leadership roles for sustainability action on campus. The SLE Program draws on the tradition of our previous Sustainable Living Facility (SLF) program, and aims to broaden the agenda to include sustainability action. This is a residential program for students committed to practicing a sustainable lifestyle, and become ecological stewards within the Ramapo College student community. ‘Eco-dorms’ or green residence facilities or sustainable living facilities – are innovative life style approaches for those of us passionate about sustainability practice, and committed to reducing our ecological footprints. This is a new movement springing up across college campuses to promote outreach and education on sustainability. They range from small (e.g. 36-occupant) green buildings with student programming, including seminars and organic gardens, where the focus truly is on ‘living green’ and infusing sustainability into the student lifestyle; to large (125-360 student) green buildings designed to save operating costs over conventionally constructed residences, but with the residents essentially oblivious to notions of sustainability. There are also campuses where ‘green lifestyles’ are being promoted in small ‘green themed houses’, with programming support, but without a green building. Additionally, campuses also lead Eco Rep programs, which are student-led programs to promote climate action and outreach on campus. This relatively new movement towards leadership and stewardship on environmental issues is a growing movement, adopted by at least sixty institutions nationwide. to promote sustainable living practices through conscious choices to reduce ecological footprint. To build a strong community for sustainability across the campus. To build awareness of the need for sustainable thinking amongst the RCNJ student body through peer education. To take a leadership role in sustainability action and outreach within the campus and across the surrounding community. Students apply for the SLE through a separate application procedure in February. Some elements of the Housing Selection process are done separately. The SLE Committee reviews applications. Please be aware that SLE selection is a competitive process and final selection will be based on your application material. Open to sophomores through seniors, with placement based on earned credits as of Fall 2018. Contact the SLE Program for additional information. Students in SLE program reside in the Village and in CPAs. Placement is based on earned credits, as of Fall 2018. This includes apartment-style living, where students are able to cook for themselves, and live with students who share similar interests. Additionally, SLE participants have access to the organic vegetable garden, located behind the Redwood CPA. 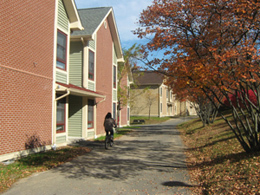 Juniors and seniors are eligible to live in the Village, which is close to the Sharp Sustainability Education Center (SEC). The Redwood CPA offers occupancy to sophomores through seniors. The Village has single rooms, while the CPAs consist of double rooms. The Village is separately metered for electricity. 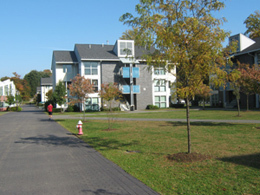 The Thomases Commons (a laundry perk), is centrally located within the Village. Redwood is south of the Lodge and close to the organic garden. All the SLE facilities practice composting. The program offers many opportunities to students to foster their interests in building a sustainable community. Live with a great ecologically minded community, with many opportunities to hold community events. Build connections with local community networks such as MEVO and the NY NJ Trail Conference. Become a community steward and learn effective leadership skills while leading cool sustainability campaigns on campus. Academic Requirement: SLE is a complete service learning program and hence,requires students to register in a 1 unit Independent Study course for service learning with SLE faculty. Eco-Stewardship Requirement: Students will commit to 40 hours of ecological stewardship work through the academic year, about 20 hours a semester. Ecological leadership work will involve engagement with RA’ and also student club leaders to promote campus sustainability. Service opportunities may include: ResLife Recycling liaison to Student Recycling Crew (collect data on volume of recyclables, encourage compliance across Residences); Liaison with Ramapo Green, 1STEP, SGA, ResLife etc. ; Engage with the two organic gardens on campus (near SEC and Redwood CPA). Students will also be expected to be attend sustainability events on campus. Sustainable Living Requirement: As SLE Program participants, students will be expected to take a leadership role in the eco-challenge as well as to abide by the Ramapo Green Sustainability Pledge. Both are geared toward inculcating a green life style and to encourage students to reduce their footprint on campus. Each SLE unit is overseen by a designated RA, who will assist in coordinating the program. The RA will also create programming events targeted to the SLE students. Each SLE cluster can have its own ‘Residential Board’, with regular meetings to discuss any issues that arise, ideas that can be brought forward, etc. The ResBoard becomes the governing body for the SLE and becomes the core of the community. The SLE program is overseen by a Committee, whose role includes the overall governance and budget for the program, and selection of students who apply to the SLEs. Reps from the SLE Res Boards will be added to this Committee after elections. Each SLE cluster has a Residential Board made up from its residents, acting as a governing body for the SLE. The Residential Board Chair is the SLE Student Director. sign and follow the SLE Contract. Significant violations of this Agreement will result in ineligibility to live in SLEs in future semesters. Students will apply to the SLE program by February 15th of the preceding academic year. Applications will be reviewed by representatives from the SLE Committee. Sustainability Resume: applicant’s name, major, overview of Sustainability Actions on campus and off campus, future plans for sustainability involvement. Narrative: paragraph (250 words minimum) describing why the applicant wishes to participate in the SLE Program. At least one letter of recommendation (e.g. from a faculty member) addressed to Professor Sangha Padhy <spadhy@ramapo.edu>. Students who are accepted for the SLEs, but whose cumulative GPA drops below 2.5 in May, may appeal to the selection committee for permission to enter the SLE program in September. The appeal should include documentation stating the student’s plan for improving their GPA. Should the appeal be denied, that student’s space will be filled from the SLE wait-list. Judicial review by Residence Life personnel to ensure no major judicial violations. Academic review by Office of the Provost to ensure no academic integrity violations.